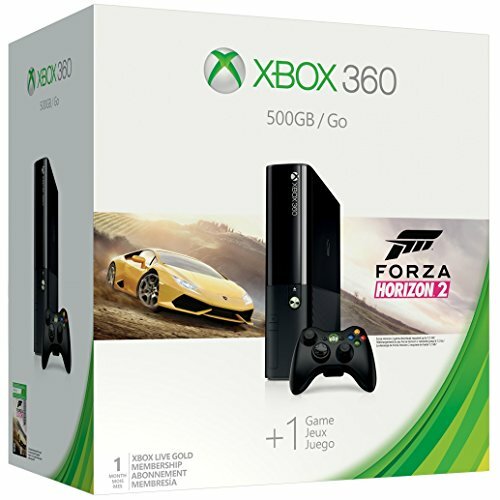 500GB Xbox 360 Console, full-game digital download of Forza Horizon 2, Xbox 360 black wireless controller, one month of Xbox Live Gold and an AC Power Cable. Your favorite entertainment apps are on Xbox 360 like Netflix, Amazon Instant Video, and HBO GO. Watch HD movies, TV shows, live events, music and sports. A month of Xbox Live Gold for advanced multiplayer, games, and exclusive discounts. Lots of room for games and movies with a spacious 500GB hard drive.